This is a great plant for well-drained, sunny sites. It has a nice form with long-stemmed, fragrant flowers. 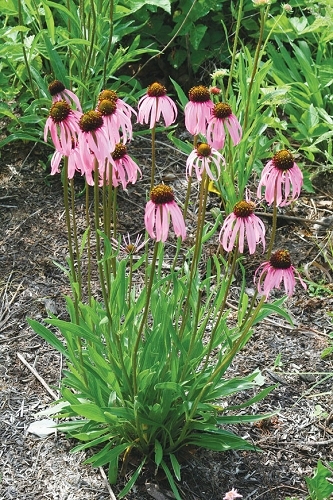 This is very similar to pale-purple coneflower, but glade coneflower has a more intense flower color and blooms a week earlier. Also, it has yellow pollen while pale-purple has white pollen. Glade coneflower is a favorite for wildlife; butterflies and bees swarm the flowers and goldfinches favor the seeds. Q: I would like to plant a butterfly garden including things like blazing star, coneflower, and salvia. Is it best to plant the small plants during spring? A: You can plant the small pots in the fall as well as spring. The species you mention all like fairly well-drained soil, so make sure you plant them in an area that will not stay too wet over winter. Snow--when we have it--is a good thing for overwintering plants as it adds insulation and keeps them from freezing. Mulch will do the same thing, and you should add mulch around the plants anyway. Q: When will seed packets be available? Thanks! A: It's hard to say. It depends on yearly harvest of seed and when it gets processed. Our seed supply is best between late October and mid January. We don't have a production field for this species, so availability changes from year to year. A: It's hard to say. We don't have a seed production field for this species, so it depends on how much we have left over after we've kept the seed we'll need for plant production. Q: Why isn't the Glade Coneflower available in seed packets like the catalog indicates? Q: How much heat can this tolerate? The south side of my house has a bed that gets hellishly hot. A: It can take a helluva lot of heat. It should be fine, especially if you get it planted in early spring or late fall.